Along with the release of iOS 9.2 yesterday, Apple also updated its Apple News app with a couple features that the double handful of Apple News partners will love. Re/code reports that Apple News now features integration with ComScore, thus giving news publishers new analytics insights into how readers are consuming their articles. (There is no mention of the competing services Google Analytics, or Quantcast, however, and ComScore is only available to the handful of official partners). That lack of analytics data bothered a number of publishers when Apple News launched, so it's good to see that Apple fixed it, but that's just one of the changes Apple made yesterday. 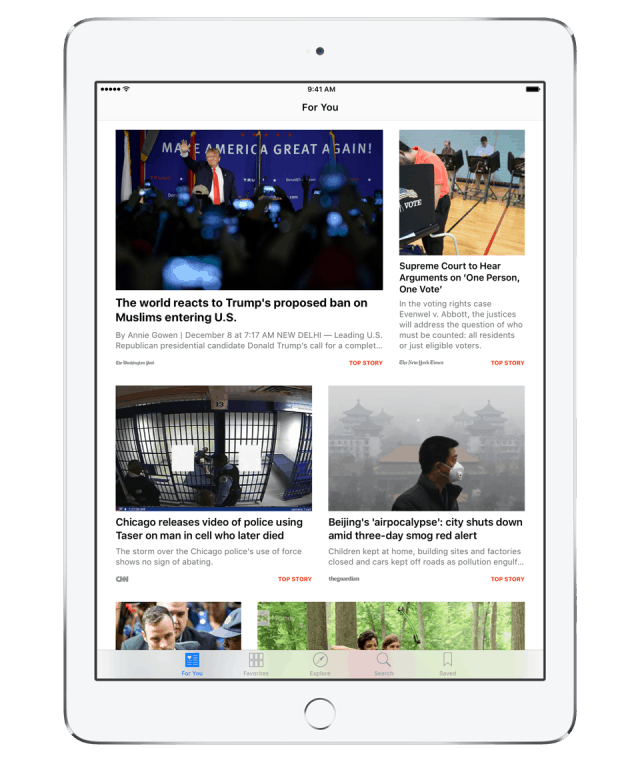 Originally intended to be both an algorithmic-based app like Flipboard and a self-directed news reader app, Apple News now features a "Top Stories" channel where readers will find stories chosen by Apple News editors. After a reader subscribes to the new channel, they'll find the Apple-selected stories in the existing "For You" menu, where they will be called out by a red "top story" badge (you can see the badge in the image above). According to the announcement in Apple News (there's no web version, sorry) the stories will be a mix of need-to-know and nice-to-know stories. All will have been curated by Apple’s editors, and re/code says that the recommendations will be updated at least a couple of times a day. That’s a change in philosophy from when Apple News launched several months ago, when the app was supposed to highlight stories based on each of its reader’s tastes and reading patterns.